Although life in the east end of Newcastle is very different now to that of a hundred or even fifty years ago, most of our streets and terraces would be instantly recognisable to any of our forebears from back then who had happened upon the secrets of time travel. An exception is the southern end of Heaton Park Road, especially the section from the railway to Shields Road, so we were especially delighted when Yvonne Shannon wrote to tell us about her grandad, who had a barber’s shop at number 60 in the 1930s. Originally the road north towards, but not extending all the way to, Heaton Hall was called Cook Street but after the opening of Heaton Park, the road was completed to allow access to the park from Byker, with the new section called Heaton Park Road (though originally it had been intended to call it Shakespeare Road) and the original Byker end renamed Heaton Park Road South. Below is a photograph of this older section which extends from the High Main pub, beyond Molyneux Court to the railway. You can just see the railway bridge in the background. The photograph was taken in 1962 just before these houses and shops were demolished and replaced by one of Heaton’s few tower blocks. Number 60 would have been immediately next to the shop on the extreme right and just off the photograph. The first occupant of number 60 Heaton Park Road South that we know of was Robert Gristwood, who ran a grocery there round about 1890. This may well have been the same Robert Gristwood who emigrated to Canada in 1911 and served with the Canadian Overseas Expeditionary Force in WW1. Robert was succeeded by 1900 by Mrs Jessie Eadie, who continued to run the shop as a grocery, while her husband worked as an insurance agent. The 1901 census records their grown up daughters’ occupations as ‘girl in confectionary shop’, so presumably they helped run the family business too. Jessie had been born in Carluke, Lanarkshire but by 1881 was living on Cook Street with her husband, William Algernon Eadie, who was at this time a ‘potter (bowl maker)’ and their two young daughters, Susan (aged 4) and baby Elizabeth. After William died in 1908, leaving the then quite substantial sum of £2305 14 shillings in his will, Jessie and her daughters moved to 221 Chillingham Road, later to become a bank, now Lloyd’s. ‘Henry Robson Pickering (known as Harry, who was my Grandad) is the man standing to the left of the photograph, next to him is his younger brother Willie and to the right of the photograph is their father and my great granddad, Joseph Pickering. The address is 60 Heaton Park Road, and in the window to the right you can read the notice ‘This shop is now open under new management’. Harry’s dad, Joseph, my great grandad, was the original hairdresser or barber of the family. He learned the trade either in Cumbria, where he was born, or in Gateshead, which was the first place he lived when he moved to the North East, and taught the skill to Harry and Willie. He had fought in WW1 enlisting with one of the four Tyneside Scottish units (not sure which one but he did wear a kilt in uniform). He came through the war unscathed but never talked about his experiences. The conditions for working people between the wars were very hard, and Joseph eked out a living for his family by getting his sons Harry and Willie to find wood, chop it into sticks then try to sell the bundles around the neighbourhood. Joseph himself used his barbering experience to cut neighbours hair for a few pennies, and, often worked at the RVI to shave and cut the hair of male patients. His other duties at the hospital were a bit macabre: he used to ‘dress’ the hair of people who had died. So, I think being proprietors of a shop would have been a real step up for the whole family. In the late ‘30’s Joseph was the marching instructor of a juvenile jazz band, The Byker Imperials and was very proud to march with them in the parades. There is a wonderful old photo first printed in the Evening Chronicle of the jazz band including Joseph posing on the steps of Heaton Park. Joseph is pictured on the far right directly under the letter J. Also on the photo, in the front row, fourth from the right (just above small cross under photo), is Jimmy Pickering, the youngest child of Joseph, and brother of Harry and Willie. Joseph was too old to enlist for WW2 but he went to work in the shipyards at Walker and he didn’t retire until the age of seventy. Joseph’s son, Harry, was about to get married at the time of taking on the barber’s shop and I’m sure it meant a great deal to him, i.e. a new start and a reliable means of supporting his wife at their new home which was to be in Albion Row, Byker. But, by 1932 they had given up the tenancy which would, I think , have been a big loss to them. Harry’s daughter (Doreen, my mother) thinks the short tenancy was due to the terrible recession of the 1930s when thousands of men were out of work and was the time of the famous ‘Jarrow March’. The Wall Street Crash happened in 1929 so in a way it was the worst possible time at which to try and set up a new business. People, ie customers, just couldn’t afford the luxury of paying for a haircut so they couldn’t earn enough to pay the rental for the shop. Throughout the recession Harry found it very hard to make ends meet and during winter he would volunteer (along with other men) to work for the corporation (council) to clear the snow from the streets using only shovels and was probably paid a pittance. He kept the barbershop chair from the shop though and did the odd haircut from his house to earn a bit of money to keep them going. To make a little extra Harry and Willie both joined the Territorial Army – The Royal Engineers – therefore, when war was declared in 1939 they were called up immediately and their first posting was to France. Harry had four children by this time and it was left to their mother, Martha, to bring them up. On his call-up papers, dated September 1939, he gives his ‘trade on enlistment’ as ‘hairdresser’ so he obviously still saw this as his main occupation. Both Willie and Harry survived the Dunkirk evacuation and we are really sorry that we didn’t ask them about how they were brought out and on which boat they were rescued. Five of Harry’s WW2 medals – one was lost! By 1942 both brothers embarked in Southampton and were sent to Burma. At the same time Harry’s fifth child was born but he didn’t see her until 1946 when he was demobbed. The brothers were amongst the last to be demobbed, Both survived unhurt except for bouts of malaria contracted in Burma. They continued to have periodic episodes of this debilitating disease throughout the remainder of their lives. Harry was also hospitalised because of Dengue fever in 1942 but recovered well. In 1947 Harry’s family were allocated a council house The Homes fit for Heroes’ initiative was instigated after WW1 in 1919 but there was still a lot of appalling housing in Newcastle. All the family thought it was fantastic, it enabled them to move from what had been slum housing in Byker to a new house in Walker where the street was planted with trees and it is here where their sixth and last child was born in 1951. They regularly visited Heaton Park and Jesmond Dene for leisure outings throughout their lives and this continues with Harry’s great grandchildren today. Jobs were plentiful after the war and Harry’s final job was at the George Angus Factory where he was a semi-skilled machinist until he retired at the age of 65. He still did the odd hair cut though including one memorable time when his daughter (Doreen) asked him to style hers, she requested a ‘tapering cut ‘ into the sides and neck. Unfortunately his idea of ‘tapering’ was not quite the same as hers and ‘I nearly died when I saw it’ and ‘burst into tears’. Another barber, George Gunn, succeeded Harry but the property seems to have been mainly empty after the war and eventually most of the block was demolished. The last few properties, once part of Beavan’s drapery, which occupied the corner site, are now part of Wetherspoon’s High Main pub. The rest of the block was redeveloped from the mid 60s. A modern tower block, Molyneux Court, was built on the site and alongside it there is now also a NHS walk-in centre. If you can provide further information about anyone or anything mentioned in this article please contact us, either by clicking on the link immediately below the title of this article or by emailing chris.jackson@heatonhistorygroup.org . This article was researched and written by Yvonne and Doreen Shannon, Harry’s granddaughter and daughter and Chris Jackson, Heaton History Group. It forms part of Heaton History Group’s ‘Shakespeare Streets’ project, funded by Historic England. This entry was posted in Group Activites, Research and tagged barber, Chillingham Road, Cook Street, grocer, hairdresser, Heaton Park, Heaton Park Road, Heaton Park Road South, Henry Robson Pickering, Jessie Eadie, Joseph Pickering, Molyneux Court, Robert Gristwood, Shakespeare, Shakespeare Road, William Algernon Eadie, WW1, WW2 on August 11, 2016 by oldheaton. Heaton and Armstrong Parks and Jesmond Dene, now known collectively as Ouseburn Parks, are amongst the finest green spaces in the city, or indeed any city, and much loved by locals and visitors alike. But have they changed much over time? We’ve been digging around in the archives and listening to the reminiscences of some older residents. However in 1878, when Addison Potter of Heaton Hall put some land up for sale, the Corporation bought 22.5 acres at a cost of £12,562 and William Armstrong gave a similar amount to enable a 46 acre park to be created. a new road was built to allow access to the park from Byker. This still to be named ‘new road’ later became Heaton Park Road. one object which the Parks Committee had in view was to give them as much play-ground as possible, so that they could romp free from the interference of the police or anyone else. 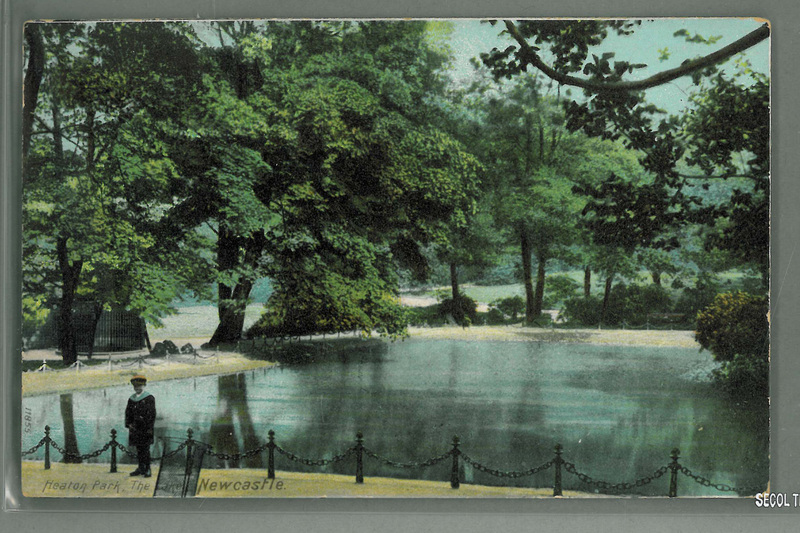 There have been many alterations to the park over the subsequent 135 years or so, some of which we can see from looking at old photographs like those below: the bear set free from (or more likely died in) its pit by the lake, the lake filled in, the croquet lawn converted to a bowling green (which itself is now no more), the ‘temple’ claimed by its original owners, the Ridley family, and removed to Blagdon, the park-keeper’s cottage demolished, the large pavilion burnt down and a replica subsequently constructed and famously the old bowls pavilion burnt down by suffragettes. The far side of Heaton Road for a stretch broke into the great rookery of Heaton Hall; and behind Heaton Hall grounds, along one side of the Ouseburn Valley, lay two parks, both public and continuous, except for the slight interruption of a leafy stone-walled lane. The parade wound by two bowling greens, mathematical swards scribbled on by tree-shadows, and watched by a terrace on which stood a huge aviary holding up the dial of a southward facing clock, flower beds of painfully formal calceolaria, scarlet geranium, lobelia, or a sort of clay boil bursting through turf to shatter into certified bush roses. But there is much that has never been officially recorded and this is where the recollections of park users are invaluable. 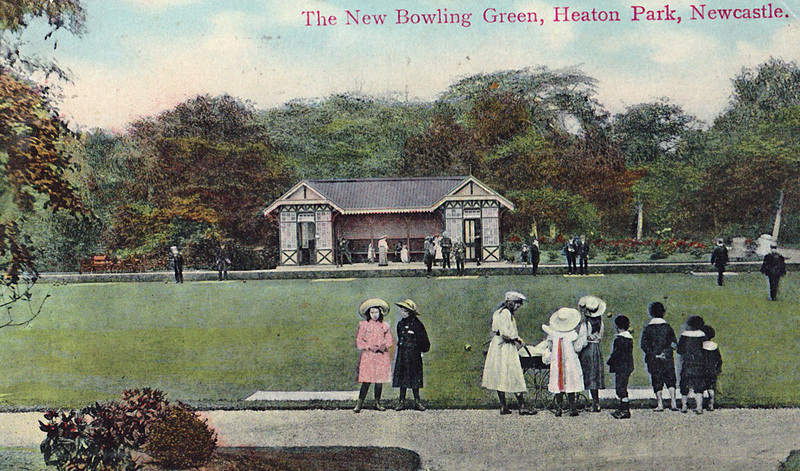 We have been interviewing local people to fill in some of these gaps and Heaton Park is almost always a topic which prompts a host of early memories. And when you went through Armstrong Park, there was a little cafe, not far from the entrance where you left Heaton Park and went into Armstrong park, there was a little cafe there. Very dark and dismal. The fellah who served was quite short… he could hardly see over the counter. We’d go in. It was a bit of a thrill. It was just so dark and gloomy. I never seemed to go there when there was a light on. We’d go in for lemonade, sasparilla. Dandelion and burdock was my favourite. The park keepers wore a sort of uniform, which was a military style cap, blue serge two-piece suit, a collar and tie, a gabardine coat when it was wet and they had a whistle and a stick and if you transgressed, which it was very easy to upset them, they used to blow their whistle at you. There were swings, a slide, wooden swings which were lethal. The seats were like inch thick planks… the swing would come back and hit you on the back of head. My mate, we had to take him to the RVI to get his head stitched. It really burst it. Lucky he didn’t fracture his skull. 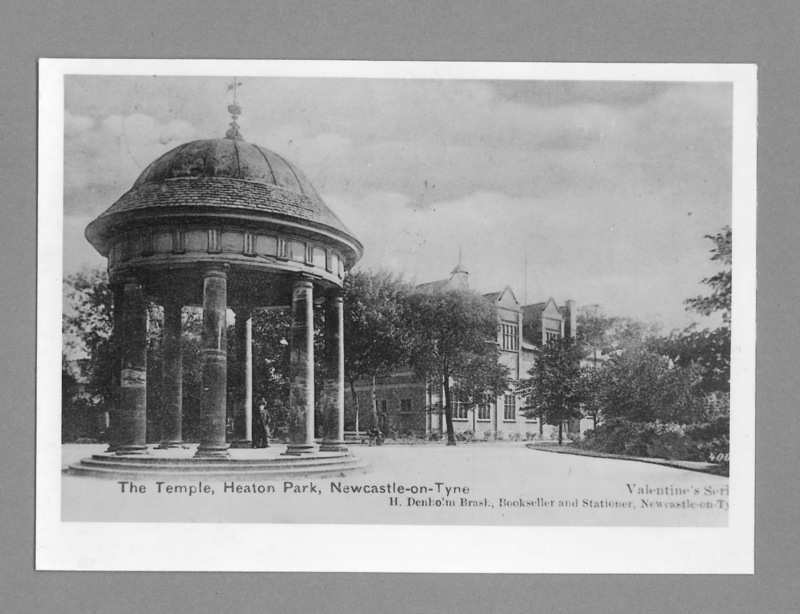 This entry was posted in Research and tagged Armstrong Park, Cardigan Terrace, Heaton Park, Heaton Park Road, Jack Common, Ouseburn, Shakespeare Road, William Armstrong on June 3, 2014 by oldheaton.